Do you want a challenge? I'm not talking about how well you can aim a headshot, or the dexterity of your fingers that speaks to how good a platform gamer you are. I'm talking about communication. OMGPOP's Draw Something is a drawing game that challenges your ability to take a concept—like "dolphin"—and translate that into a drawing. The game component comes into play (see what I did there) when you send that drawing off to an opponent. Your opponent then has to decode your undoubtedly clumsier-than-expected drawing and enter the word that represents the original concept. It's like Words With Friends but with charades. You're still working with a specific set of letters to form words, but they're tied to the image sent to you. Although the game is inherently competitive and you'll compete for coins, it is also collaborative. You can choose between lower level concepts like "bell" and "meatball" or more difficult options like "windmill," "Britney," and "metroid." Based on your choice, coins will be awarded to you accordingly. The best part about this drawing game is that it's unintentionally hilarious. Poodles and bowls of salad come out looking like a mess of lines, and if you're using a smaller iOS device you might curse the game for making you feel like you have chubby fingers. The game also creepily lets your opponent watch every move you made while trying to draw out your prompt, and even while trying to guess words for the drawing you received. Watching a recording of my aborted drawings and my scrambling to erase them while my opponent is clearly observing confusedly is a bit of light comedy that I wasn't expecting from Draw Something. Another bonus to playing this game is inventing mini-challenges for yourself. I found I was often trying to solve the puzzle before my opponent had finished drawing it. It let me give myself mental pats on the back whenever I was successful. I also like to be a little cruel by drawing out elaborate scenes and making my opponent sit through the creation of my masterpiece before cluing them in to what they are looking for. For "wedding" I drew an entire ceremony. I drew a detailed landscape painting complete with beach loungers for "bay." Sometimes I liked to mix it up and would draw a cat, "+", fish for "catfish." I'm really just a bundle of joy. During the first few rounds of the game, it might be uncomfortable to jump straight into the more difficult categories. You're only given a limited set of colors: black, red, blue, and yellow. If you want access to more specific colors—like green, purple, and orange—you'll have to fork over your hard-earned coins. Or you can purchase them, but I'm pretty sure I know how everyone will feel about that one. Winning the game comes down to two requirements: 1) being able to interpret the drawing, and 2) being able to unscramble the set of letters on the screen to properly guess what the image might be. If one or the other fails, you can always rely on the alternate requirement to help you along. Unfortunately I've noticed that a lot of people like to cheat. That, or they are downright terrible artists. A big yellow blob does not immediately tell me "Pac-Man." Writing "Blah, Slam, Blah" and me guessing "slam" correctly totally does not count. I absolutely love games that let you interact with people—strangers and friends alike. Even if these interactions are minuscule compared to the more robust games you might find on your console or PC, it's a fun and bite-sized way to add a bit of enjoyment and socialization to your day. 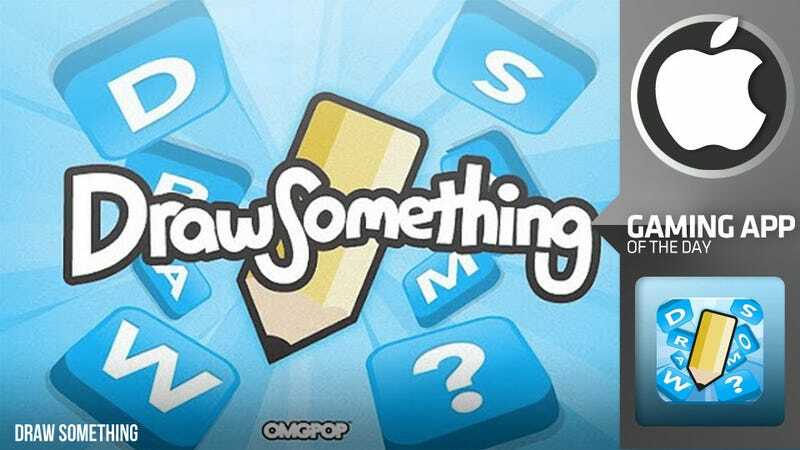 Draw Something takes it to another level by adding a very unique kind of gameplay that is incredibly addictive. I have 11 games open right now. I'm pretty sure I'm addicted.